This Valentine's Day, make sure your love is the only thing infectious! 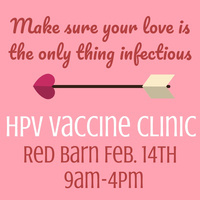 Campus Health Services will be offering an HPV Vaccination clinic on 2/14/2019 from 9 AM to 4 PM in the Red Barn. Bring your ID and your insurance card. Staff will be available to verify insurance coverage. HPV is the most common sexually transmitted illness in the U.S. The HPV vaccine is safe and effective and can protect against diseases such as genital warts and cervical cancer.